Cherry Picker Hire – Do you need equipment that will allow you to do your job at considerable heights? Then you must consider a cherry picker hire from Boom & Platform Hire. As a business owner, most certainly you want things done fast and efficient while keeping the members of your team safe at all times. Thus, instead of opting for stairs and other pieces of equipment that may not be that stable and safe, go for that kind of equipment that will protect your team, your employees and allow you to be effective in each and every project you’ve set out to do. Boom & Platform Hire is a plant hire company that you can rely on when you are sourcing any type or size of cherry picker hire. 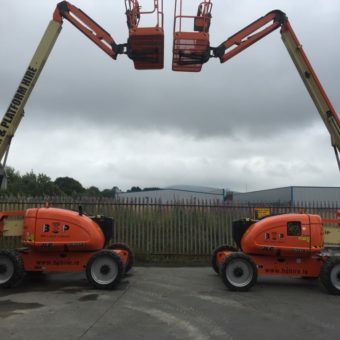 At Boom & Platform Hire you will be engaging with a company with over 20 years of trusted business and professionalism who have a large range of cherry pickers, new, refurbished and regularly maintained by the Boom & Platform in house mechanics. Be assured you will be hiring the best Cheery Picker Hire possible. Cherry Picker Hire – Why engage in Hiring? Many construction type companies simply cannot justify investing in buying a cherry picker without constant usage and thus hiring a cherry picker when required is the best approach. No need to worry about storage, security, continuous maintenance and of course a large financial outlay and related burdens. At Boom & Platform Hire you can hire a cherry picker as your needs and projects require, short term or long term, throughout Ireland. Cherry Picker Hire – Why Boom & Platform Hire? We consider all our customers as Partners and to that extent we work closely with our customers ensuring that their cherry picker hire facilitates a positive outcome for their projects and customers. Our cherry picker hire pricing is very reasonable and our support is unrivalled. You will be joining a long list of extremely satisfied Boom & Platform Hire customers, who have helped build our company into the nationwide plant hire company it is today. Did you have to refuse a potential client because you lacked a proper platform needed to perform a specific task? No more losing clients….keep clients coming back to you by utilising Boom & Platform Hire as your Cherry Picker Hire business partner. Our company maintains the highest standards by having only the best machines, platforms, equipment and engineers. We know what it means to rely on the equipment you have and deliver the results each client is expecting from your company. Besides offering cherry picker hire, we can also give you the chance to buy used equipment at very competitive prices. Again, the quality you will find in our used equipment is superior because we value each and every customer. For us, providing quality is a sign of respect not just for you as a client, but also for your work and efforts. So, if you need a reliable cherry picker or any piece of plant hire equipment in our catalog, don’t hesitate to contact us and let us know how we can be of service. We are prompt and time and money-effective, so we are certain that we won’t let you down. Email or call the team in Dublin or Cork on: 045 900 932 or 021 463 5600.